April 22, 2018 at 12:08a.m. Ralph Fitzgerald of Austintown Fitch runs away from the field in the Division I 100-meter dash at the Mahoning County Track and Field Championships at Fitch High School on Saturday. Fitzgerald captured the Division I boys Rob Ruane Award for the meet. Ralph Fitzgerald wants to be challenged and, in turn, likes to challenge those close to him. He understands that to be at his best, he needs to be pushed. At the 105th annual Mahoning County Track and Field Championships on Saturday, Fitzgerald was at his best in winning a pair of individual titles and anchoring a pair of winning relay teams. 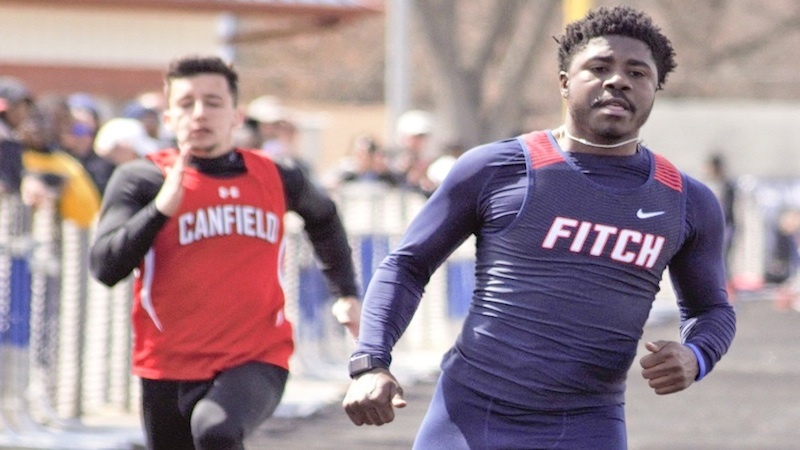 No one was keeping Fitzgerald from where he wanted to be at Greenwood Chevrolet Falcon Stadium as he won the 100- and 200-meter dashes and anchored the championship 400 and 800 relay teams to lay claim to the Rob Ruane Award and help Fitch’s boys win a team title. That doesn’t mean Fitzgerald just scores his points and calls it a day, however. The best of Fitzgerald’s ability meant winning the 100 in 11.31 over runner-up Rocco Almasy of Poland, who finished in 11.47. In the 200, Fitzgerlad got the better of Almasy again. This time, Fitzgerald won with a time of 23.05 to Almasy’s 23.41. The 800 relay team of Tyrese Bandy, Anthony Caulton, Drew Bretsik and Fitzgerald won in 1:31.72 and the team of Shane Hewlett, Caulton, Bretsik and Fitzgerald won the 400 relay by more than a second in 44.35. Garrett Walker of Springfield won the Rob Ruane Award in Division II. He won the 100 and 200 dashes and was part of the winning 400 and 800 relay teams. South Range won the D-II team title. May 8, 2009 12:09 a.m.